There’s so much crap in children’s bookshops and children’s tolerance of what is put in front of them is so immense, it should not be abused. That’s why it seems worth singling out some of the enduringly good books that, thanks to librarians and online purchasing, are still available. All of which indicates that even as a child, Norton was intent on staying true to the logic of the fictional universe that was taking shape in her mind. 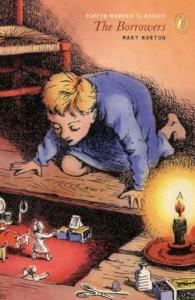 It would take until 1952 – by then, Norton was 49 years old – before The Borrowers was finally written, and published. Life and family cares had intervened beforehand. 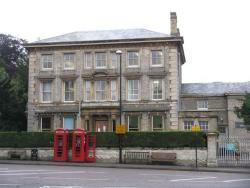 Born in 1903 as Mary Pearson, Norton was raised in the kind of rambling Georgian house and surroundings in Buckinghamshire that would later provide the backdrop for much of her fiction. At 23, after a brief career as an actress with the Old Vic theatre company, she married the shipping magnate Robert Norton, and followed him and his job to Portugal for the next 12 years. When the shipping firm went bankrupt and her estranged husband joined the Royal Navy at the outset of WWII, Norton moved with her four children to the United States. To help support her family, she wrote and published her first book The Magic Bed-Knob. Later, after she had returned to England, this work was expanded and renamed Bed-Knobs and Broomsticks and eventually made into a successful film by Disney studios. By the mid 1970s, Norton and her second husband Lionel Bonsey were living as successful tax exiles in Ireland. She died in 1992. When we first meet the Clock family of borrowers – father Pod, mother Homily and their only child Arrietty – they are living in the walls and under the floorboards of a large house peopled with humans, from whom they ‘borrow” all of their needs. Care must always be taken with the manner and the extent of this stealing, in order to avoid detection. Not to mention the perils of say, the family cat that took cousin Eggletina. While the worlds of the borrowers and of the ‘ human beans’ do manage to co-exist – ‘two households, both alike in dignity’ as the book’s narrator puts it – it is always in a precarious balance. 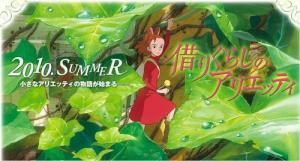 Inevitably, it is daring young Arrietty who upsets the natural order, and not before time. After all, we have been told that the race of borrowers is declining in numbers, and shrinking in size. Change and risk then are just as essential to survival in the long run, as any of the social skills endorsed the status quo. That’s a pretty good message for young readers to receive. Just in case there is still anyone out there who hasn’t read these books, the borrowers are not fairies or sprites. The genius touch is that Norton depicts her tiny heroes as immensely practical beings – what they ‘borrow’ they adapt, often ingeniously. They also face very familiar human concerns. Pod and Homily strive to protect their adventurous child from coming to harm in a dangerous world, yet without stifling her spirit or without turning their way of life into a prison. Arrietty also has to bend, and adapt. Early on, she comes to learn that her desire for freedom– which brings her into contact with a friendly human boy – threatens to bring destruction down upon her family’s entire way of life. Eventually, as the parents later explicitly acknowledge, this striking out as refugees into the wider world eventually proves to be the right thing to do, despite all the hardships that it involves. Clearly, millions of readers have found something enchanting about the idea that the things that we misplace and lose may actually have been taken and put to use, by a race of tiny people living unseen in our midst. In addition, much of the charm of these books lies in the mastery of detail that Norton brings to her universe, and to the borrowing lifestyle. My own feeling is that while this is rendered with rare imagination – Norton knows just how a pin or a button might be integrated into a tiny world – the real lasting power of the series resides in its three dimensional treatment of family life. Oh no.. It shocked her to be right. Parents, were right, not children. Children could say anything, Arrietty knew, and enjoyed saying it – knowing always they were safe and wrong. It is tempting to keep quoting further examples in this vein. Suffice to say that the respect eventually earned by the mother, Homily, is particularly hard won. During most of our early encounters with Homily, her anxiety takes many unattractive forms. She fusses, she scolds, she is excessively protective of Arrietty – this is a classic mother/teenage daughter relationship – but we eventually come to realize that Homily’s smothering, and the snobbishness that she sometimes exhibits towards other borrowing families are merely the outward projections of her concerns for her daughter, and of her worries about the family’s security. Beneath this is a hardy spirit that sustains her family. None of their clothes had been washed for weeks – nor, for some days had their hands and faces. Pod’s trousers had a tear in one knee and Homily’s hair hung down in snakes. And here was Aunt Lupy, plump and polite, begging Homily please to take off her things in the kind of voice Arrietty imagined usually reserved for feather boas, opera cloaks and freshly cleaned white kid gloves. But Homily, who back at home had so dreaded being ‘caught out’ in a soiled apron knew one worth of that. She had, Pod and Arrietty noticed with pride…invented a new smile, wan but brave and had – in the same good cause – plucked the last two hairpins out of her dust-filled hair. ‘Poor dear Lupy,’ she was saying, glancing wearily about, ‘what a lot of furniture ! Who-ever helps you with the dusting?’ And swaying a little, she sank on a chair. They rushed to support her, as she hoped they might…. During the 1950s, The Borrowers were such an immediate hit that several sequels soon followed – The Borrowers Afield came out three years later in 1955 – and it introduced a love interest for Arrietty in the shape of Spiller, a socially awkward but resourceful young borrower from the wrong side of the tracks. 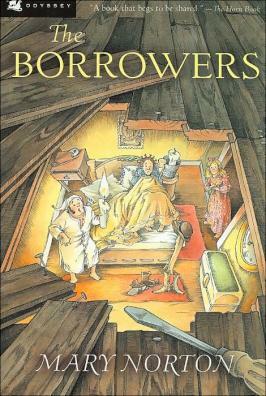 The Borrowers Afloat came out in 1959, and The Borrowers Aloft two years later. After a long gap, The Borrowers Avenged came out in 1982. Like Cynthia Voigt’s Tillerman saga, this is one of those rare series where the quality is sustained throughout. Later on this year, The Borrowers is likely to gain an entirely new audience. The renowned Studio Ghibli of Japan ( makers of Spirited Away, My Neighbour Totoro and Princess Mononoke etc ) is about to release their animated version of the story, to be titled The Borrower Arrietty. The film will not be directed by the Ghibli master Hazao Miyazaki, but by a veteran company animator, Hiromasa Yonebayashi. The website ( in Japanese ) for the film is here and it appears to contain daily video postings. In Japan, Arrietty would fit right into a ready made mould. Pippi Longstocking and Anne Shirley of Green Gables are two other daring, rule breaking female heroes who have won cult status within a Japanese society that exalts conformity. Given the exceptional quality of the BBC television version of The Borrowers that was released in the early 1990s – in which Ian Holm as Pod displayed the same sturdy decency he was later to bring to the role of Bilbo Baggins – the Ghibli crew have a tough act to follow. The American 1997 Borrowers film starring John Goodman by the way, is a terrible, and should be avoided. One final note about these books : they are are exceptionally good to read aloud. Some have put this down to Norton creating the stories as bedtime amusement for her young children, during her long lonely years in Portugal. It may also have something to do with the way the books are cleverly structured as narrations by a human being – old Mrs May – who is telling the story of the borrowers to young Kate with reference to her brother and to his stories about the borrowers, with Arrietty’s own diary adding yet another ‘fact or fiction’ element of documentary. On paper, this sounds confusing. In practice, it adds further ingenious touches of ‘realism’ to the events being described. Just what level of reality should be assigned to the world of the borrowers can be a matter of some concern to the characters, too. At least for some of them. ‘No,’ said Arrietty, ‘I’d say it was my father.’ . Gordon Campbell drew upon articles, quotes and essays on Mary Norton contained in the Children’s Literature Review for this essay.